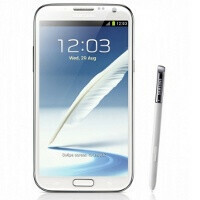 Samsung Galaxy S IV to launch in April with S Pen functionality? Here is a juicy rumor fresh out of Korea - the Samsung Galaxy S IV might be the first handset in the series to launch with an S Pen and the accompanying functionality as Samsung is allegedly looking to unite its Note series with the flagship Galaxy S IV. This would be a huge change for Samsung and interestingly enough is allegedly confirmed by a quote from a Samsung official. Moreover, Korean sources agree that the Samsung Galaxy S IV will launch in April. Along the way, we are hearing more confirmations that the S IV will indeed come with a 5-inch 1080p AMOLED display, something that almost seems like a fact right now judging by what the competition is bringing. Additionally, whispers are that the new Samsung Android flagship will run on Jelly Bean and be powered by a quad-core Exynos 5440 chip manufactured using 28nm high-K metal gate technology. It is also possible that it will use ARM big.LITTLE architecture with an energy-efficient A7 processor for basic tasks paired with A15 for more intense loads. Other details about the upcoming Galaxy S IV are a 13-megapixel rear auto-focus camera and slightly thicker, 9.2mm body, a development that would make it very Note-like. How does this all seem to you, do you think that a slightly thicker S Pen-equipped S IV is a good idea or not? No. S Pen should be a Note only feature. If the Galaxy S line were to get an S Pen, that would take some of the glory off of the Note line, and just make it a bigger Galaxy S.
True, and no need for rumor on JB thing, it's granted. The Note is just a bigger Galaxy S.
... With an S Pen that grants extra functionality. That doesn't stop it from being an oversized Galaxy S phone. in a regard yes, it is an oversized Galaxy S device however it is not JUST an oversized Galaxy S. that's what he was trying to convey. Besides a few phablet features I don't see how it isn't just an oversized Galaxy S.
you just contradicted yourself. the Phablet features and tight integration with the S-Pen separate it from being an oversized Galaxy S. without them it would be a larger, higher end Galaxy S.
I didn't contradict myself. Even with them the Note is still a larger higher end Galaxy S.
You said the Note was JUST an over-sized Galaxy S. Now, you are saying it's a large Galaxy S, but with special features dedicated to that kind of device. It's those special features that separate it from the Galaxy S line and make more appealing to consumers. You contradicted yourself. the key word you're forgetting here is "just". If the Note is an oversized Galaxy the iPad is an extremely oversized iPod touch? Do your research first before you comment. You know the iPad has more features than the Touch. Can the Touch get a cellular connection through 3G and Lte? What I am saying is that they aren't entirely the same. The iPad is a tablet, which can use many tablet apps that the iPod can't use. The only weaksauce here is the responses. that doesn't disprove CanYouSeeTheLight's comparison being equivalent to the one you made to the Galaxy S and the Galaxy Note. there's apps the Note can use that the S can't because of it's Phablet cclassification so yeah, all weaksauce. Sorry, bad analogy. What you say is completely correct, but that's the problem, you are correct, and he is wrong, so the analogy doesn't work. Then the iPad and iPad mini are both over sized iPhones using your same logic, correct...? Don't forget the larger screen. You can do more productive things on a larger screen. Sammy has an ad out about that concept. Have you not seen it? PA even has an article about Sammy's ad. Net-net, Note II is a bit more than 'just' a bigger GS III. Those can be done on tablets. a Phablet is a viable alternative to those who don't want to carry both a phone and a tablet. Except you are carrying both a tablet and a phone. The Note II gives you both functions in one package. I see more excuses than I do legitimate counterclaims. and he completely gives up after this last comment. Listen, if you're gonna start a troll war, then please have the balls to finish it.